Orchard Barn at Andersey Farm in Lockinge, near Wantage, Oxfordshire sleeps 8 people. Andersey Farm near Wantage is set between three Areas of Outstanding Natural Beauty: The Cotswolds, the North Wessex Downs and the Chiltern Hills; these two luxury spacious barn conversions are in the heart of South Oxfordshire in the Vale of White Horse, set on a working sheep farm. These semi-detached barns, located adjacent to the owners’ home, have been very well designed, offering spacious rooms and comfortable surroundings set in picturesque countryside. Each barn has its own outside area and also boasts an atrium off one of the bedrooms and the kitchen area. 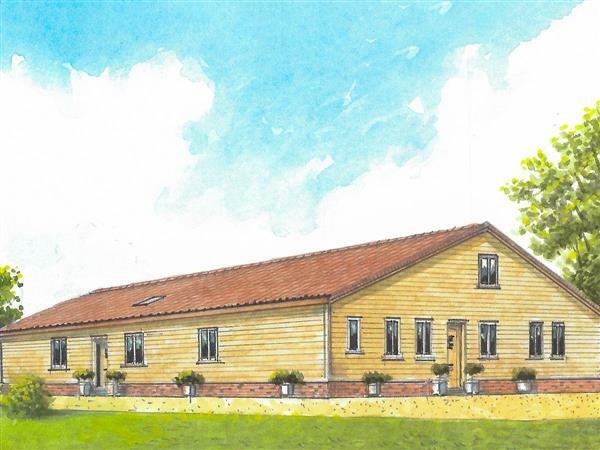 The furniture, fixtures and fittings are all high specification and the barns have been beautifully decorated. The Fold (ref UKC2007 [The Fold]) and Orchard Barn (ref UKC2008) can be booked together to sleep up to 14 people. Bedroom 4: With king-size bed and en-suite with shower cubicle, toilet and heated towel rail. Oil central heating (underfloor on ground floor), electricity, bed linen and towels included. Initial logs for wood burner included. Travel cot available on request. Welcome pack. Enclosed courtyard with patio, garden furniture and barbecue. 1 dog welcome, to be kept on a lead at all times (working farm). Bike store. Private parking for 2 cars; additional parking for 2 cars available. No smoking. Holidays at Orchard Barn, Andersey Farm run from Friday to Friday. Pets allowed at Andersey Farm - Orchard Barn. For a better idea of where Andersey Farm - Orchard Barn is, you can see Andersey Farm - Orchard Barn on the map below. Andersey Farm - Orchard Barn is in Oxfordshire; should you be on the lookout for a special offer, you can find all the special offers in Oxfordshire. It's always worth checking to see what is on offer at the moment. Do you want to holiday near Andersey Farm - Orchard Barn (UKC2008), you can see other cottages within 25 miles of Andersey Farm - Orchard Barn; have a look to find your perfect holiday location.